Dobyns Dining Room, The Keeter Center: College of the Ozarks, Hollister, Missouri Tigger Travels - Family Adventure Journal Photos From Tigger`s Travels and MORE! Just south of Branson, Missouri the next exit you will find is the exit for Hollister. Turn west and in about 1/2 mile you will see an enormous log building ahead on the right at the top of the hill. The Keeter Center is a company that is operated by the worthy forces of the College of the Ozarks student body, primarily those that and studying for their degrees in the hospitality industry. 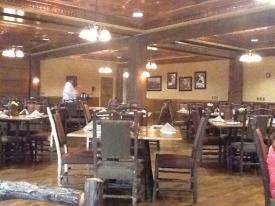 This facility turns out chefs, managers and many other members of the service industry world wide. We called in a reservation at about 5:30 pm for a reservation after 7. We were put on the schedule for 7:10 but arrived 20 minutes early and were seated right away. The dining experience is equal to any fine dining experience. The service is top notch and the menu is filled with a fine selection. 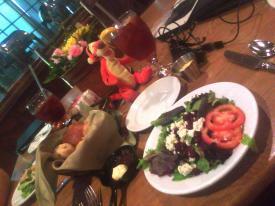 Tigger enjoys salad and bread. We were served by Ariah, a nursing student at the college. He was personable and knew the menu very well, able to answer all our question knowledgably and even offer recommendations. The dining room was not very full, Ariah was there at every key moment offering refills when needed and any other requests we may have had. Our meal started with a large platter of House Chips ($5.50). To grasp the freshness of the food served, one must first understand that most of the produce and meat is raised on the college's agricultural school at the on campus farm. 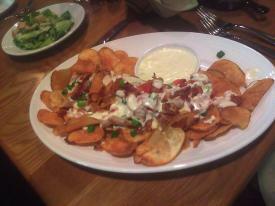 That being said, these fresh, thinly sliced potatoes were topped with a blue cheese cream, tomatoes, bacon and green onions. It was enough to start 4 meals but the two of us did a number on them because they were so crunchy and delicious! Jennifer ordered a prime rib ($20.95?) medium rare and I ordered the catfish but after discovering the catfish was sold out for the day I got a prime rib medium well. Just as we finished our salads and House Chips the meals arrived and we dug in. Again, on the fresh note, we have remnants of a 1/4 cow in our freezer that was grass raised in a field by a neighbor, it is the best beef we can find. 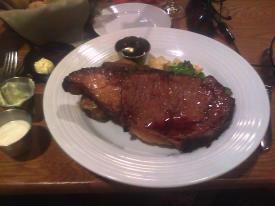 The taste of beef raised without hormones and chemicals is unbeatable as with this 10 oz prime rib. With both platters as finished as we could manage, we got a doggie bag for our two teen sons to dig into once we got home. 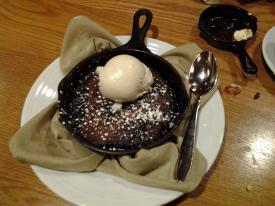 We ended the meal by sharing a Chocolate Cobbler a la mode ($8.25). This small cast iron skillet is baked with the cobbler drowned in its own self-basting chocolate sauce. If your mouth is not watering, it should. It was topped by a generous scoop of home-made vanilla bean ice cream. Over the past decade, Jennifer and I have experienced a large number of fine dining experiences and this evening gave one of the best values ever. 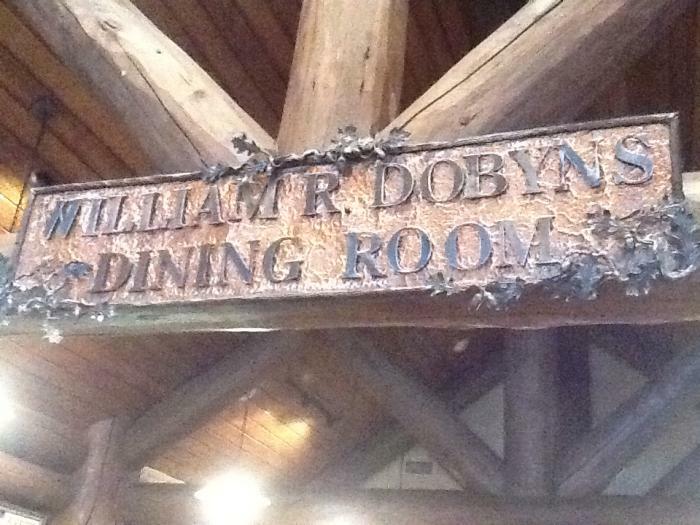 Whether looking for a quiet dining experience for two or a facility to hold a large fancy banquet, Dobyns Dinning Room at The Keeter Center proves to be a capable spot at a very convenient location just south of Branson.